Everything Dinosaur can exclusively reveal that those clever people at CollectA will be introducing a new Deluxe Spinosaurus replica into the company’s highly successful “Prehistoric Life” model collection. In total, three new Spinosaurus models will be available as CollectA updates its model range to reflect changes in the way that scientists interpret fossils. Leading the way in interpreting dinosaur fossils. Spinosaurus is one of the most famous of all the dinosaurs and 2015 marks the 100th anniversary of the naming and formal scientific description of this iconic dinosaur, widely believed to be the largest predatory dinosaur that ever lived. Back in September of last year, Everything Dinosaur team members reported upon the publication of a new scientific paper that showed this dinosaur in a whole new light. Based on a comprehensive review of the known fossil data, scientists proposed that Spinosaurus walked on all fours rather than just its hind legs (obligate quadruped). The title of the paper, published in the journal Science “Semi-aquatic Adaptations in a Giant Predatory Dinosaur”, just about says it all. Here was a new way of interpreting the fossils of a Theropod dinosaur. Spinosaurus aegyptiacus was depicted as a predator perfectly adapted to a life in rivers and lakes. Think of Spinosaurus as “a dinosaur that decided to become a crocodile”, it’s a crude analogy but it does make the point. Ironically, Everything Dinosaur had been inundated with enquiries from dinosaur fans and serious model collectors about whether a replica showing this new interpretation of Spinosaurus was going to be produced. We can exclusively reveal that CollectA have done this, and this model will be available from Everything Dinosaur in July (or thereabouts). The Deluxe Spinosaurus measures approximately 36cm in length making it around 4cm bigger than the Deluxe 1:40 scale T. rex dinosaur model also made by CollectA. The size of this new replica, reflects the current scientific thinking that Spinosaurus aegyptiacus was indeed, larger than Tyrannosaurus rex. This new model has been very skilfully crafted and it will have an articulated lower jaw. 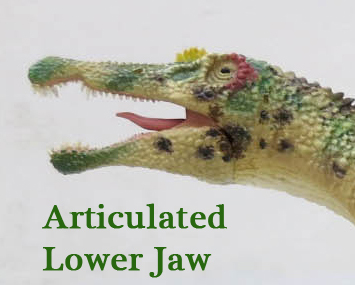 The introduction of articulated jaws is going to be a feature of many of CollectA’s 2015 product offerings. Both the eagerly awaited Deluxe feathered T. rex and the 1:40 scale Acrocanthosaurus dinosaurs, which are due to be introduced in the spring, will have articulated lower jaws, as will the 1:4 scale Guidraco Pterosaur replica. Model features an articulated jaw. If this news wasn’t enough to get dinosaur fans roaring with excitement, CollectA will be introducing a total of three Spinosaurus replicas in 2015. The new Deluxe Spinosaurus will be replacing the company’s current Deluxe Spinosaurus. Joining it will be two smaller models in the very popular, not-to-scale model range. The existing Spinosaurus model in the not-to-scale range will be replaced by two replicas, one depicting Spinosaurus on land, the other, a model of Spinosaurus swimming. These two figures will be available from Everything Dinosaur later on this year, and, as soon as we have photographs we will be posting them up, but we do know that each of these replicas measures around 26cm in length. The 2014 reinterpretation of Spinosaurus attracted a lot of attention from the scientific community. 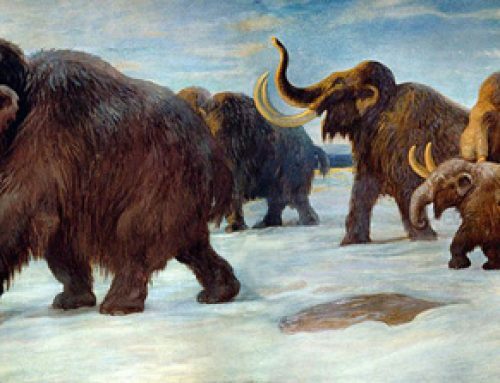 One of the most controversial areas was how this dinosaur might have protected its huge thumb claw when it walked on four legs. The idea of Spinosaurus walking on its knuckles has been suggested. We at Everything Dinosaur are delighted to hear this news and we can’t wait to see the models themselves. When we have more information we will post it up. Promise! Deadlines were missed for the print run for the new catalogue but rather than wait another ten months or so for the new brochure, it was decided to launch these models in 2015 anyway. We shall post up pics of the other two Spinosaurus models in the near future. This is so sad. According to Scott Hartman, there is a 27% math error in the length of the rear legs, making the “new” Spinosaurus a dwarf as well as a chimera based on the remains of three different spinos and three other non-spinos. Everybody is so phyched about this thing while it may well be seriously wrong…. You are absolutely right to make this point, we were quick to praise Scott Hartman’s article “There’s something fishy…” which was written in the aftermath of the “Science” publication. We ourselves, pointed out a number of potential anomalies in the re-interpretation back in September. However, we think this is a really bold decision by Collecta and we applaud them for doing this. This model challenges preconceptions about the Theropoda, the replica is based on the 2014 review and updates the Spinosauridae story, taking it albeit in a controversial direction. In our view it provides an intriguing perspective and it is a great way to mark the 100th anniversary of the formal scientific naming of this genus. If you review the literature, a quadrupedal stance had been proposed before, we think this model will help the debate and discussion. Our teaching team are already looking at ways in which they can use this replica as a teaching aid to help explain how our views on the Dinosauria change over time. Thanks for your input, we welcome your comments and feel free to leave some feedback when we publish images of the other two Spinosaurus models from CollectA. Apart from Scott’s “professional” view, in my very “unprofessional” view, one look at the hand and wrist bones is sufficient to nix any notion of them being load bearing. This is so sad? Really? Because Hartman, who was not in the loop, says it looks wrong, made the legs bigger and said “Yup! that’s more like it…” What sad is someone that had no access to the original material, was not there during the measurements and discussions of the evidence, can sway so many amateurs into thinking that if it doesn’t look right to you, just tweak it till it does. I absolutely can’t believe this is happening.I clearly remember sending CollectA my suggestion to CollectA and some art references for helping.This is so awesome!I’ve never seen something like this.It’s a stunning model,I love everything about it.CollectA puts out some great surprises among their lineups every year.I love CollectA.Also,what a great touch with collectors that releasing no lesser than 3 models!I guess the other two will be based in this one?Also,was this model going to be included in 2016’s lineup? P.S.Thank you for passing CollectA and other brands suggestions from us collectors,it really is helpful and very nice of you.